Compared to the hustle and bustle at other clubrooms, a quiet atmosphere fills the editorial office. Computers are filled with pictures taken by reporters and bookshelves are full of magazines. Reporters can be found editing their articles and asking for feedback from others to ensure they are truthful. It’s an incredible look at the life of seven reporters working diligently to create captivating layouts by referring to older editions of the magazine and working as one to create a masterpiece. This is the one and only English press at Sookmyung Women’s University, The Sookmyung Times. It bridges the gap between Sookmyung and the world. 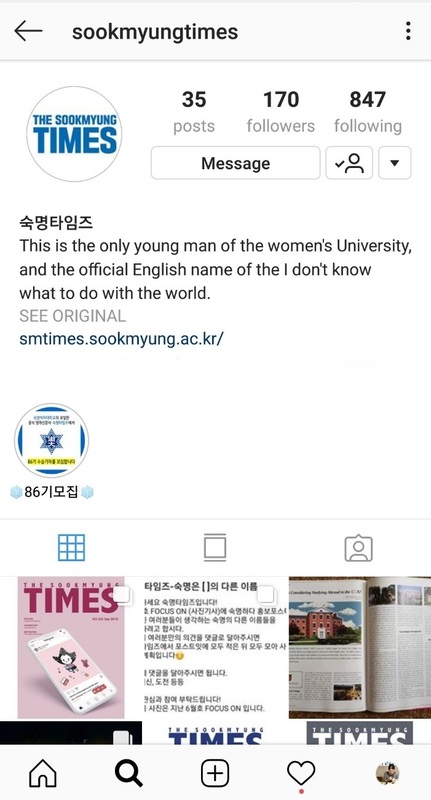 The Sookmyung Times(SMT) is an affiliate of Sookmyung Women’s University’s press. It was first published as a newspaper on October 25, 1973 celebrating its 46th anniversary this month. SMT is now a monthly published hardcopy magazine, with the exception of the months of May and November, which are online publications only. SMT focuses on a variety of themes under the section headings such as ALUMNAE, PEOPLE, ON SMU and SMTRACING, which convey school related information. There are also participative and fashion articles such as CHEOGPA RUNWAY, GLOBAL REPORT, and WE.R.IN. In addition, SMT is divided into three major divisions, namely Society, Woman, and Culture which cover current issues of university students under the story headlines FEATURE and COVERSTORY. Apart from these, there are always articles on diverse subjects-things to do, exhibitions, movies, and books. SMT reporters engage in meeting for choosing topics that have the greatest appeal to its readership, revising their articles three times, and modifying layouts to best match the feel of the articles. Reporters also provide feedback on each article in order to improve them and ensure quality for the readers. After publishing magazines, 100 magazines are placed in distribution stands in front of each building around campus, and everyone can obtain information about it on www.smtimes.sookmyung.ac.kr. SMT is the only English press focusing on on-campus concerns. Other universities also have English publications such as The Yonsei Annals, which is the Yonsei University’s English newspaper. It analyzes and reports on events that occur off-campus and in Korean society like clubs that help the disabled and fight for human rights. Yonsei Annals publishes its stories online in PDF form in the hope of attracting more readers because in today’s society the most convenient means of viewing the news by university students is on the smartphone. Another English newspaper is Mirror at Sungshin Women’s University. Mirror is noticeably different from SMT. It performs its role according to three categories: reporters, design teams, and photographers. It is doing an amazing job of getting students’ completely involved in the publication process from beginning to end. English publications that publish in English link the world to their schools. SMT celebrates its 46th anniversary this October, but it has gone through a lot of changes to reach this. Changes can be seen when comparing past issues with present format, especially in terms of design, article content, and webzine publishing. When it was first published, the newspaper was half the size of a general newspaper. However, it grew to the size of B5 paper upon its 100th publication, and it shrank to its current A4 size in 2002. The cover has gone through just as many changes. Until the early 2000s, photographs that matched article contents were featured. In the 2010s, the covers introduced Korean traditional costumes and objects. Then, from 2014, Sonwflake, Sookmyung’s mascot, began to adorn the cover. SMT reporters are considering making the new cover more article-related and it gets good reviews every time when the magazine is published. In addition to cover changes, reporters are modifying article content. In past issues, JOIN US introduced school clubs, and SOOKTALK and SOOKMATE gave exchange students an opportunity to express their thoughts on specific subjects. MAPGAZINE would also offer Sookmyungians up-to-date information on worldwide issues using map drawings. However, they have been replaced with articles such as CHEONGPA RUNWAY that features a student’s fashion style, SMT CULTURE that reviews movies and books, and FORMAL ARTICLE that gives reporters an opportunity to comment on recent issues. Not only have SMT reporters tried to rejuvenate the magazine, they have also started publishing a webzine that publishes except for May and November, the two webzine publications, all other issues are published both as hardcopy magazines and online on the website. Despite constant change and effort, SMT has yet to overcome a huge problem, its number of readers. SMT collects and counts the leftover magazines as a measure of readership as an objective indicator. In addition to the number of remaining magazines, the number of students participating in monthly events indicates that SMT readership is low. It can be a reason that people are afraid of reading English writings. While it could be scary at first glance, it is interesting. Lee Suyoung, Department of English Language & Literature ‘18 said, “While I think the topic and content of SMT articles are very good and beneficial, it is natural for SMT to face hardships regarding readership. To be honest, the interesting content and images are wonderful, and the level of English doesn’t make it a burden to read, but I think the prejudice against English has led to low interest in SMT.” SMT does its best to fulfill Sookmyungians’ satisfaction by providing information to students, even if it is in English. This problem has been a constant issue for SMT and it is one that SMT will continue to struggle with. Gaining student interest in SMT is important. SMT attempts to pull in Sookmyungians through CHEONGPA RUNWAY, GLOBAL REPORT, WE.R.IN, and HEAD TO HEAD, but according to the SMT’s survey, somehow students view these attempts as unsatisfactory, for exchange students. The Argus, the campus English magazine at Hankuk University of Foreign Studies, targets not only its Korean students but also its exchange students by featuring interviews with them regarding current Korean and world issues in the section Brain Swap. The magazine also hosts an annual English Essay Contest. In the past, SMT had a similar column, but it was replaced. It is time to consider that reissue. It is important for SMT to start to get creative in order to increase readership. Along with content change, promotional attempts need modification. The number of followers on Facebook and Instagram is 75 and 170, respectively. The two platforms are well organized and posts are uploaded monthly. However, the number of people actually viewing the posts is not great. The University Life, Kyung Hee University’s English media outlet, has 2,300 followers on Facebook. The magazine uploads current news using card news and its main columns are filled with photos and summaries. Even Kyung Hee University’s press is written in English, it is simple and easy to read. Besides SNS promotion, there are other means of promotion, but SMT still needs to consider rejuvenating its Facebook and Instagram accounts since they are powerful mediums of promotion. The other problem that SMT needs to resolve is familiarity. Copy Editor of SMT suggested article length could be another possible reason for students’ apprehension of SMT. Many Korean students fear English text, so SMT should consider shorter articles that are more focused and present only the core of an issue. SMT has also tried to realize this measure and is trying to reduce the length of articles or have several shorter articles on the same topic. Besides this, contacting famous celebrities could be another solution. For example, there was increased interest in the 345th magazine’s interview with Shin Jiye, the feminist politician. SMT attempted to develop a more powerful article that centerd more on the person, useful information, and that shed more light onto affairs, but remain light and enjoyable for all readers. Hong Dahee, Department of English Language & Literature ‘17 said, “Nowadays a lot of Sookmyungians love the stray cats on campus, so it might be worthwhile if SMT did something in collaboration with Sookmyung’s alley cat care club, Sookmyujigyo.” Like this suggestion, collaboration with unique Sookmyung Women’s University clubs or associations considering not to only focus on intorudcing will be a solution. According to a SMT survey, students wish to read more articles about exchange programs and the personal experience with exchange students. SMT dealt with the shortage of exchange programs and participants in the 336th edition and promises to endeavour to present these types of articles more frequently. SMT also vows to always be mindful of its readers’ opinions as it develops The Sookmyung Times. Since 1973, The Sookmyung Times has delivering not only relevant campus issues but also issues of great interest in culture, society, and woman. Furthermore, reporters have strived to improve each section by featuring exhibitions, experiences, and fashion in order to attract Sookmyungian readership. Nevertheless, readership is decreasing each semester for both off and online issues. Please SMT readers, keep in mind that by attempting the crossword puzzle in each issue, you gain a chance at winning a Snowflake school souvenir. From all of us at SMT, we hope you find our latest changes attractive and meet your wants from a campus magazines that its content is beneficial. Your interest and sincere comments are always welcomed and please be with us to make a better media outlet for you.